After yesterday's discussion of Cèdre, I thought I would revisit Miel de Bois, yet another Serge Lutens fragrance that I initially disliked but slowly came to appreciate. It was released earlier this year; the nose, as always, was Christopher Sheldrake, and the fragrance notes are ebony, gaiac and oak wood, aquilaria aguillocha, honey, beeswax, iris and hawthorn. Miel de Bois is an unusual fragrance, and to be honest, I recoiled in dismay the first time I smelled it. It starts with heavy, very dry woods overlaid with raw honey. If that sounds lovely, well, think again: it is an extraordinarily harsh, almost caustic smell, and the hawthorn note that soon begins to weave through the composition increases the dissonance, at least in the short run. After 20 minutes or so it calms into something much milder, almost a skin scent, really. It is still heavy, dry woods, but without the abrasiveness, and the hawthorn and iris smooth out the jagged edges and leave a velvety finish. The honey is quite strong, but the sweetness is tempered by the wood, so that there is nothing candied or syrupy about it. There is a little hum of smoky incense, hardly noticeable, and a hint of beeswax. It isn't conventionally pretty, exactly, and I wouldn't call it feminine either, but it is extremely compelling. One of the things I so admire about the Serge Lutens line is that he doesn't create a unisex fragrance in the usual manner, by amping up the fresh citrus notes and toning down the florals, but rather by creating a scent that is completely outside of any preconceived notion of what fragrance ought to smell like on anyone, male or female. 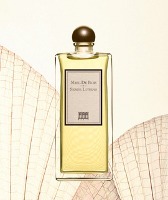 Miel de Bois is not the first Serge Lutens that surprised me, and surprise is rare enough in fragrance that it makes second, even third and fourth tries worth the effort. Miel de Bois is in the Serge Lutens export range; for buying information, see the listing for Serge Lutens under Perfume Houses. Update: in 2010, Miel de Bois was moved into the exclusive range. Hi R! I disliked this immensely when it first came out and called it many names including the “Pledge” of perfumes. The other day I tried a sample I had and guess what – it is growing on me. I doubt I will ever buy it but I will certainly not call it Pledge. BTW – apparently this does not sell too well. R – before I forget (mentioned just now reply to your comment on MdB) – Melodrama is really gorgeous – my kinda perfume. Maybe a tad too floral for you. A very dear friend got a sample for me. Apparently Harvey Nicks are being quite generous. Hawthorn! You said the magic word R. I would try anythign for hawthorn and I haven't tried M de B yet. I must now. M, I will be so curious to hear if you like it. It seems to have very few fans. Happily, SL never seems to discontinue anything (I think??). Oh, this is one Serge Lutens fragrance I cannot wear. I will not even begin to say what it reminds me of. Suffice to say, I am not a fan. Just yesterday I was thinking I must bring this out again. I love it, and what many others see as acrid I just get this glorious dryness. Both this and Un Bois Sepia has gaiacwood as notes — maybe that's what I like. And the honey is raw and wild, you're right — nothing cloying here. You captured Serge Lutens' appeal very well — he does reject conventional notions of what perfume is supposed to smell like. Sometimes it's brilliant, sometimes (like Arabie, I'm afraid) a mistake, but always interesting! No worries R- I will try and get a sample and send with with the next pack. Thank you so much N, I would love to try it, even if you think it is probably too floral for me! I like gaiacwood too, and have just realized that Un Bois Sepia is one I've never tried. Will have to hunt up a sample. Incredible. I could never get past the cat-piss top of it. I can't promise I'll try it again, but at least you've made me think maybe it isn't a complete disaster. Potentially it's just half a disaster. T, it really doesn't smell like cat piss on me, but I can completely understand the reference. The dry down is so wonderful that I have come to appreciate the top, just as in Tubereuse Criminelle. I like it. I wouldn't wear it, but I find it warm and very pleasant. It didn't have to grow on me; I liked it from the start. I'm currently trying very hard to appreciate Bornéo 1834 – I've failed so far. Miel de Bois was, for me, one of those experiences where your nose recoils from the bottle so fast you get whiplash! Fox pee and honey. I tried spraying it on skin, and it turned into neat but immensely cloying honey. I think this just doesn't agree with my chemistry… But I do love Borneo. Well…MdB isn't awful on me, really it's not. If someone gave me a bottle, I would keep it. But is smells too much of honey & beeswax to ever be a favorite of mine. Still….the dry down isn't bad, not bad at all. Soft, subtle, mmmmmm, cozy. Perhaps I've found the key for me & the SLs! I'll try all of the ones most people dislike & I don't stand a chance of ever owning. (Like TC, La M & ISM, for example) Hey, maybe I'm on to something. Just tried a bit on – you may like it a lot – a floral-chypre. My, my, R! You are very open-minded. This one is unique, I'll give it that, but way too ammonia (translation “urine”)/honey/beeswax-like for this perfume-loving gal. I don't know what makes it so harsh, but if it didn't have that component, it might be quite lovely. Oh well! Cristaline and I were smelling it at Barneys the other Saturday. Chypre is the magic word around here, of course! N, fox pee, LOL! It is funny how many people associate it with urine of one kind or another. I am still working on Borneo, but don't have high hopes. Yes, cozy is the right word. And I love both TC & ISM, so your strategy might be perfect! I really like Miel de Bois. There is a lady who I work with and everytime I wear it, she says that I smell of Lillies. BTW, when I bought it, even the SL sa turned up his nose at my choice. He said it was awful. Then again, he knows tat I only seem to buy the unusual scents. Yes, R, ammonia is right — I hadn't thought of it, but that is exactly what it is. Hope you & D found something else wonderful to smell at Barneys! Do they have all the Laura Tonattos there yet? B, that is too funny that the SA turned up his nose! It always makes me laugh when they admit that they can't stand a fragrance, since they so rarely do admit it. Yes, they do! Oh, wait a minute, they still had not received the new one, Il Duce, or something like that. Hopefully that one will be in at the time of the L'Artisan event on November 4th. Anyway, of the ones I smelled or tested, Ma'mo was the best. I love the combination of pears, mint and vanilla, though the fragrance tends to be fleeting. S, I would agree that it is not as sweet at Botrytis! And yes, a real sample of the Borneo. Need to try it again, but so far: nicely done, but hey, it is patchouli & I am not likely to love it. Click on October 3 on the calendar on the right and you'll see the blurb on Melodrama. It is by C. Sheldrake for Space NK. Oh dear, this was the only SL scent that truly repelled me – okay, Arabie was pretty bad too. It smelled like a dirty baby's nappy. I have not wanted to try it again. R, I find the patchouly rather subdued, but it´s there, no doubt about it! So what's with the hawthorne? I asked about it a few months ago, when folks were loving it. I have never seen hawthorne EO or abs. I know the scent of the berries and wood and leaves (faint, feh.) Is the hawthorne fragrance a synth, like oakwood? Still, I can't believe it would be very strong, and no offense to those who like it, intriguing or lovely. What does it smell like? Ah, N, I do believe Fresh's Lemon Sugar is the champion “Pledge” of perfumes. I've yet to come across anything else that is so, uh, Pledge-y. R, I have a bunch of LT samples, but Ma'mo is not among them. Will look for it! T, looks like you are not alone! A, as usual, I only know what it smells like from perfumes: Daim Blonde, FM Eau d'Hiver, etc. It is also in Apres L'Ondee, so has been in use in perfume for a long time. End of my knowledge! I had a similar experience with Daim Blond. I believe it's the honey note that calls to mind various kinds of pee. I LOVE Miel de Bois…got it on a whim simply because it was available for a great price and lo and behold, I adore it. I agree the opening is a bit much, but on me, the drydown reminds me of a sweet, resinous incense, and I'm reminded of the basenotes in Caron's Narcisse Noir. I love it and it's gonna be perfect fro crisp atutumn days! Thank you! Yes, it could be the honey. I will have to find out where I can get some raw honey, I've actually never smelled it. You'd better not come near me: I've been wearing Fleurs d'Oranger almost exclusively for the past three years. LOL! How kind of you to say so! Indeed, no one's complained so far. K, So glad you like it too! Soiled cloth diapers is not a ringing endorsement, LOL — apparently this is very much a “love it or hate it” kind of scent. J, LOL at “not right away”! I would prefer an honest SA myself, although you would think they would take the trouble to find out if you already like something before they start criticizing it! Clover honey smells a good deal like pee. Open up a jar and take a whiff. See? Actually, so does clover. I enjoyed Miel de Bois initially, less so as it dried down on me. It turned into pretty much just clover honey — and strong honey at that. It lasted longer than any of his other scents that I sampled, but I found it the least interesting. I find for honey scents, I prefer something light, like L'Occitane's Eau de Miel (Honey Water). When it comes to honey, less is more, I find, in avoiding the pee purgatory. I love the mix of honey & woods in Miel de Bois, and the urine thing doesn't bother me at all. But based on all the comments above, you are not alone in preferring something lighter! Once again late to the party- funny both this, Chergui and Santal Blanc were ones that I had to have for the opening notes: just the things that most people have hated. I don't smell pee, but I do smell raw honey and wood. That first burst smells to me almost exactly like the honey we would buy at the apple orchards where I grew up in New England- an almost acrid sweetness cut by the sap smell of the wooden box it came in and the wax from the cone. Once again, the dry down in fabulous. I love that a lot SL's fragrances have that olfactory gob-smack of an opening. Borneo is practically the only patchouli I could ever stand. Ever. Enough that I jumped through some serious hoops to get a bottle in the US. I hope it grows on you. LOL — don't know what you ended up doing, but as much as I love MdB, not sure I'd wear it to work either! I ended up scrubbing it- and several layers of skin- off of my foot. It was just too much for me, and I had to leave for work. I'll try it again some other day, but it was just a little…much. I also tried Douce Amere, and it was nice, but very powdery on my skin. I'll give that one a better try when I'm not reeling from MdB. I told my coworkers about it (they know about my obsession) and they all thought it was pretty funny. I just wish I was experienced enough to pinpoint that note that was driving my crazy. I think it might be the hawthorn, it smelled vaguely familiar, but also disturbing. Odd. I think I might have to track down some absolutes just to build a base on. Oh dear, hope your feet will recover! I think it's more likely that what bothered you was the honey, but who knows. I can also detect a note of violet that is never listed in the ingredients, and a powdery feeling of pollen. I have been told several times i smell to violet candies (that here in Spain are very popular) while wearing Miel de Bois.